This is a loom for new and experienced weavers. The perfect classroom loom. Whether you are learning to weave for the first time, want to learn new techniques or sample your wonderful yarns, this loom is fun and easy to use. Just add yarn! This is the perfect gift for a new weaver. Anybody can weave on this wonderful little loom. 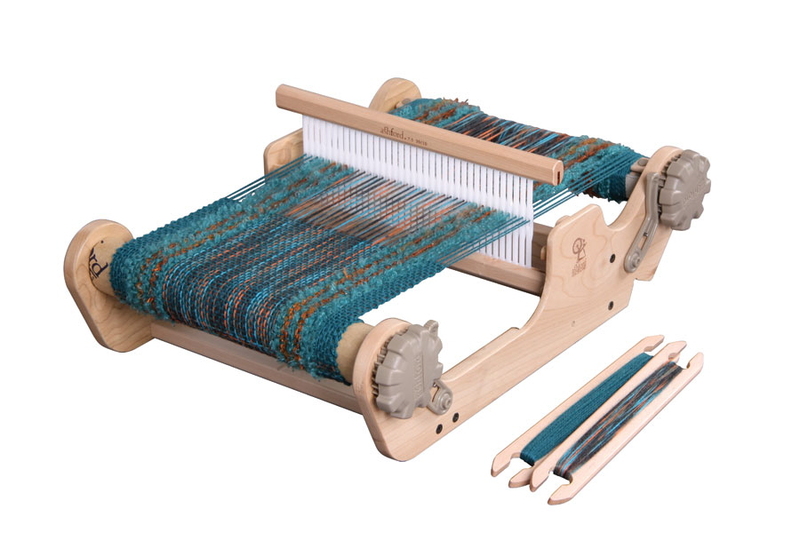 The 25cm (10ins) weaving width allows you to sample all your favourite rigid heddle patterns, textures and colours. Weave scarves, fabric and more. So compact, it is only 1.4 kg (3lbs). The loom is made from beautiful solid natural Silver Beech timber and has strong handles, ratchets and clicker pawls so your warp never unwinds unintentionally. Built-in second heddle option. Also available are 2.5, 5, 10, 12.5 and 15 dpi (10, 20, 40, 50 and 60/10cm) reeds so you can weave fine to textured yarns. Included accessories: 7.5dpi (30/10cm) reed, step by step instruction booklet, 2x26cm (10″) shuttles, threading hook, warping peg and clamp.